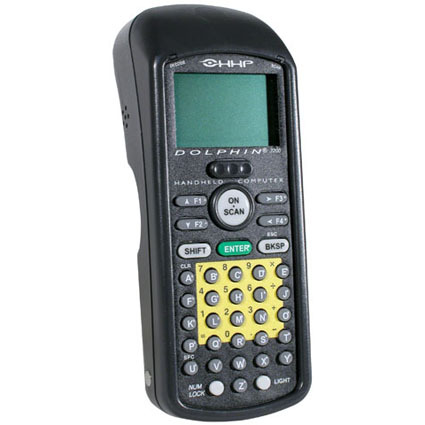 The HHP Dolphin 7200 is a rugged, pocketsize computer and bar code scanner with an open DOS architecture and up to 12 MB of memory. Ergonomically designed for both right and left-handed use, the Dolphin 7200 is available with a variety of integrated scanning options for exceptional performance on all major linear bar code symbologies. The Dolphin 7200 is discontinued. Please call your sales representative for a suitable alternative. Dimensions (W x D x H): 6.85" x 2.63" x 2.25"
Development Tools: DOS architecture programmable with standard x86 development tools, Borland ® and Microsoft ® C/C libraries provided for non-PC standard functions (laser engine support, communication & power management).